While hubby was in the military, we were stationed in Washington. I loved it because for the first time in my life I was able to see the seasons change. I saw leaves turn from green to yellow and then to orange. I loved seeing fresh fallen snow and hear the sound if it crunching as I walked through it. Then flowers would bloom in the spring and we would stop and pick berries on the side of the road in summer. It was amazing to see the glory that God had created. It was magnificent to see how the world changed with each season. Just as the weather goes through various seasons of change, we also experience seasons of change in our own lives. We have stormy seasons, calm seasons, and season that are as bright as a summer day. 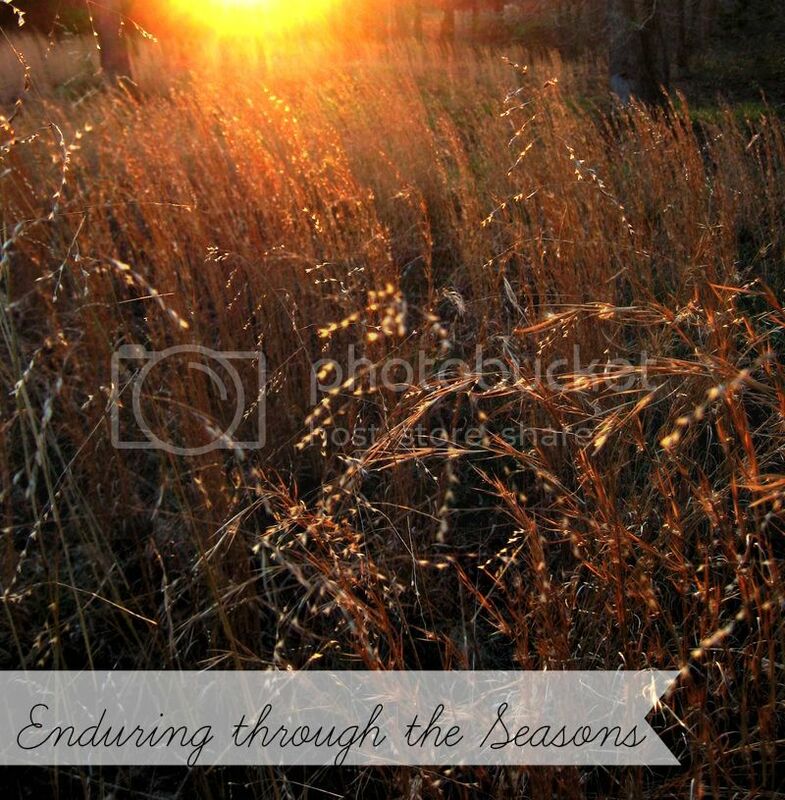 It is through these seasons that we live this wonderful life. Recently I received an email from a very sweet reader. She was asking me how I coped when things got rough. I've been thinking on this question all week... wanting to respond, but not sure how. When my family started living on a small income, it was not by choice. Things were rough. We had very little money and had two little bits to take care of. I am just going to be real with you....it was scary hard. We didn't have insurance and no job prospects for the future. Everything was very uncertain. Have you heard that whole thing about blind faith? Well we were totally walking blind with nothing to hold on to but our Faith. The one thing we did have was food storage (Thank you Bishop Myers for telling me to do it. Little did you know it would be our saving grace a year later). We lived off that food storage for quite a while. It was that food storage that allowed us the time we needed to figure out how the heck we were going to make it. We had planned as much as we could. We knew hubby may not get a job after getting out of the military (there were no jobs anywhere), but all the planning in the world, doesn't soften the blow when reality strikes. While reading I was reminded that when we go through hard times in life, that is when we are going through a stormy season. The storm may be like a light rain or it may be more fierce.... hitting like a tornado, but it is life's bitterness that allows us to recognize, contrast, and appreciate its sweetness. While hubby and I went through our storm, we were constantly reminded that although things were rough now, if we endured, then our spring would come. Sometimes it was hard because spring seemed so far off in the distance. We had to patient. When we got discouraged we reminded ourselves to just take it one day at a time. If you are in debt, take it one day at a time. If you are dealing with sickness, take it one day at a time. If you are emotionally, physically, or spiritually struggling...take it one day at a time. It will get better. For us, enduring was something we couldn't do alone. We needed God's help. Being poor and struggling was not a punishment. God was not angry at us and he certainly had not forgotten us. He was always there wrapping his arms around us as we cried in frustration. In our darkest hour he is always there....for you and for me. When my hubby and I were struggling financially, we learned so much about ourselves and each other. Where other couples would buckle under the pressure and fight, we cleaved to one another. We talked about everything and made plan after plan. If one plan failed, then we made another one. Going through that storm was inevitable. It was necessary for our progression. Had we not gone through those hard times, I never would of learned the greatness I had inside me. Had we not had to be frugal, Blissful and Domestic never would have come to be. I would be missing out on such an amazing Summer (getting to know amazing people all over the world). While in that storm, hubby had to go to the hospital. They thought he had a tumor on his brain. Before they did an MRI, we asked them to be honest with us and not sugar coat anything. We wanted the worst case scenario. They told us that if it was a tumor, then my husbands time here would be short. It was heart breaking news. We cried. He received a blessing from his brothers and off he went for the exam. While hubby went to get the MRI done, I remember going into the bathroom and falling to the floor. I didn't understand why we had to go through more. I didn't understand why our storm had to get worse. I already felt like we couldn't handle anything else. It was in that dark moment that I knew I had to pray. I prayed for my husband, for my family, and for my children. I prayed that whatever the outcome was, that I would have God's strength to get me through it. I also told God I wouldn't be angry. I told him I was thankful for temples....for knowing I would be with my husband forever...even if our time on this Earth was cut short. At the end of my prayer, I knew God was there with me. I knew that as I sat on that bathroom floor crying, that he was crying with me. I gave it all over to Him, knowing that anything was possible if I had faith in Him. An amazing thing happened....Jason's test results came back negative. He didn't have a tumor. What an amazing blessing that was. We had stood up to the storm and finally after months of struggle, the winds were finally calming down. After that short stay in the hospital, our storm began to move on and spring was sprung. Since then my hubby was able to graduate, find the job in law enforcement he had been spent four years working towards and praying for...oh and we finally have insurance. Woot woot! If I could go back, I wouldn't change a thing...not a single moment, tear, or second of heartache. Because of that storm, I appreciate the season we are in now so much more. Our storm lasted for a long time and I know it won't be the last one we have to endure. There is no question to whether or not we will have to experience seasons of adversity. It is going to happen, but how we will weather the storm is up to us. It is up to us whether or not we turn that trial into a blessing. We will endure both pleasant and painful times in our lives, "but no mater the season, as followers of Jesus the Christ, we will rest our hope upon Him as we walk toward His light". "We are Saints of God, determined to learn of Him, to love Him, and to love our fellowman. We are pilgrims on the blessed road of discipleship, and we will walk steadfastly toward our heavenly goal". Let us be Saints in spring, summer, fall, and winter. Let us help one another, as we all go through our own seasons of joy and hardship. Love one another and uplift one another. The world is already full of enough ugliness, lets not add more to it by ugly words and thoughts towards one another. Lets be like Christ and show kindness in all we do. Today I pray for you who are struggling. I pray with all my heart that you will have hope. That you will know that it can get better. Know that God loves you so much and that you mean the world to Him. He gave his Son, so you could live with Him again. Have a wonderful day lovelies and as always thank you for the support and kindness you show me each day. You are amazing! This was a beautiful note. When I'm feeling down, I think of the suffering that Jesus Christ went through for us, I think of the mothers that have to watch their children go through chemo, I think of my own mother who's battle with scleroderma has been terrible. Thank you for starting and maintaining this blog. Every day I read it, I think of new ways to better myself and the lives of my family. I couldn't have put it better. Thank you for sharing your story with us Danielle. It's through the hard times that we show our true character, and you're right to get through those hard times and be ok let's you appreciate the good times even more. Thanks for having this blog, being positive, creative, and compassionate. You're a great woman. thank you, I needed this today! That was beautiful and encouraging. My boyfriend and I are making our future plans, he graduates soon... and while all is happiness for the start of our life together, We know there will be storms and seasons changes. This is a reminder that Spring will come after all. Thanks! Im going thru my own "storm" this your, very similar to yours and very different as well. Its been an entire year of our unexpected journey God thought we needed to take It started with my own husband getting very sick, we had no answers I was watching he die more and more each day and no one could tell us why, He was hospitatlized in Feb for 11 days, came home with a PICC line and IV meds I had to give him each day, home health nurse visits, then he was "better" until April when he got sick again, same thing, that time he had a ruptured appendix (not a normal one, as bad as it could get) in the hospital for another week that time, then 2 weeks later our worlds literally turned upside down, not something I can share at this time, but Ill never forget that day in late April, weve been facing that ever since, today we face another milestone concerning it, its not something I want to do but its something we have to do, Its times like this I just want to be as carefree as my kids are, I don't want to be a grownup and have to go thru things like this, its times like these its just no fun, so yes I don't know why God put on this unexpected journey but I keep the hope that I know that hes got his reasons and they'll come out someday. The last several weeks my husband and I have had a "calm" put on us, melting the stress and most of the worry away, I know God is working on us, I believe hes working on our situation as well. This is just another season change, just another journey. Weve had some hard ones in the past years, preemie babies, sick babies, birth defects, surgerys, financial struggles, medical bills, I just remember that we got thru all that, all those things we didn't think we could, hes always provided for us when we needed it, I have no reason to believe he wont do the same this time. Thank you for sharing!! I needed to hear this today to remind me to keep my faith and lean on God. This was a wonderful post friend. We have been going through major storms in the past couple of years. I have had my "crawl in a hole" lows with very few highs. At some points I felt we were in a hurricane that would not stop. BUT through it all my faith somehow would shine through. It is hard to see the light at times, but that is when our faith is tested the most. And when I have grown the most. You learn to take nothing for granted and to have hope and faith there WILL BE better days. And there are a few better days now and then!!! Thanks to my Heavenly Father! Thanks for sharing your life and the encouragement I say dearly need to hear from time to time. And if you have time read my post from today only to find the link at the bottom....Out of the Wreck I Rise. Wow! This is amazing!! Thank you for sharing this, sometimes you need stories like this to get you going!! What a beautiful post! Thank you. I really needed this one today. We had trials of financial hard times in our lives, and sickness, but I have found that the worst trial so far is the loss of a child - not physically - but the withdrawing of a child into a dark place where I cannot reach him. Looking back, all the other trials seemed like nothing, although they were very, very hard at the time. I know that this too will pass, at least I am trusting God and trying very hard to have faith that it will pass ("help thou my unbelief...") Thanks again. We are all going through rough stuff, and it helps to know that one day there will, no doubt, be joy! I just told a friend yesterday that it seems everyone is going through something right now - we all have it better than some and worse than others. I enjoyed your post. And your blog. It gave me goosebumps when you talked about how your blog would have never come to be if it hadn't been for hard times. It gave me perspective on how I'm going to use my hard time positively in the future. A great read - thank you for being so open and comforting. My trials may be small but having faith in uncertainty is a saving grace. Such a sweet post Danielle!! What a blessing this post was to me today. I am in the midst of a difficult season and often have trouble making it through my days. This post had me in (happy) tears. Thank you, Danielle. What a precious post - thank you! My "word of the year" is season - and these thoughts fit perfectly with that theme. My own family has been going through a season of illness for the past five years. Some days are very, very hard. But I'm thankful for the reminder that these sufferings are for a season - they won't last forever! Blessings to you and your family! What a beautiful post. you and your family have learned the true meaning of life at a young age and that will affect every decision and thought you have the rest of your life. And that will make them better decisions and thoughts. Here's wishing you and your family good times and smooth sailing. After saving for soo many years we bought a new home only to find out that it had toxic mold. We lost everything! We left that house with 2 small garbage bags of personal items, everything else had to be burned. All the material things can be replaced but our 2 pets can not, they died from being toxic. The only one affected from the mold was me and while it has ruined my health my children and husband were spared. There is no going after the builder as he went belly up but at least we have each other! material things are just that, it's your family and friends who matter most of all! Wow, Danielle! THANK YOU for this post. It had me in tears! It's funny(ironic) how so many of us are weathering storms right now, each our own, some worse, some easier, but that we are all holding to our faith and leaning on each other, too! It's amazing to have support and understanding from so many people. This is just what I needed today. Working on our budget that seems to be getting ever SMALLER despite our hard work, is frustrating and makes me feel like a failure. Then I remember that we're in this position for a reason, and I'm reminded of all the things we've been doing right, and I thank God for His comfort! Blessings to your family, and everyone here! Thank you for your beautiful post. My hubby and I are going through our own financial storm right now but I know it will get better and we are not alone. Your words were what I needed this morning! Thank you so much for writing this! It was so helpful to me to know that others have their own storm as well. I've been concentrating so hard on my storm that I had forgotten that others may be going through their own. I know I am growing in faith and through God all things are possible. Thanks again! Thank you for this post and for the reminder to trust and have faith even when it seems like all is lost. Wow this is a really great post. I completely agree with what you say - sometimes it's hard to remember that things will get better when you're in what you think is the worst part of your storm. I think finances are something that everyone has/will struggle with and really, it's how you handle the situation you're in. You can sulk and be sad but where does that get you? Keep your head up because THINGS WILL GET BETTER. Thank you writing and sharing this. Thank You, I am going through a terrible storm at this time and it has been too long since I have sat still. I really needed your post today. Thank you for your encouragement and your prayers. Thank you. I needed to hear this. We are in the middle of a storm. We are praying and hoping things will work out and our family will be together. You are an inspiration.